Brenda Maier is a member of The Society of Children's Book Writers and Illustrators and a teacher in a large, suburban school district. When she isn't writing, she enjoys traveling with her family, baking peanut-free cookies, and watching her five children build amazing creations from found materials. She lives near Tulsa, Oklahoma, where she is surrounded by piles of laundry and even bigger piles of books. 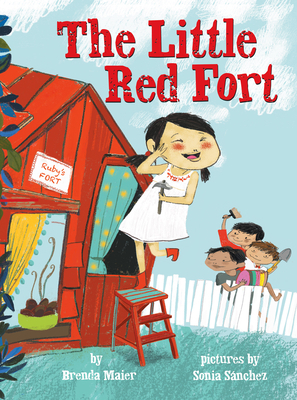 The Little Red Fort is her debut picture book. Sonia Sánchez paints with both traditional and digital brushes, using layers of texture in her work to evoke emotion and movement. Her debut picture book Here I Am by Patti Kim received two starred reviews and was nominated for an Eisner Award. Sonia lives with her husband and son and a sleepyhead cat in a blue house near the Mediterranean Sea on the eastern coast of Spain.